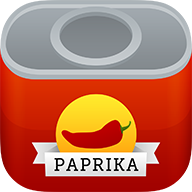 I purchased Paprika 3 on my iPad, how do I install it on my iPhone? My grocery lists are syncing very slowly. What happened to the Detect Clipboard URL feature? Why does Paprika 3 show that I have a different number of recipes compared to Paprika 2? My recipes have not fully synced to Paprika 3. I've upgraded to Paprika 3, can I delete the old version now? How do I transfer my recipes from Paprika 2 to Paprika 3? How do I copy and paste a photo into a recipe? Paprika 3 has been released as a universal app, so after purchasing it once on iOS you will be able to install it on both your iPhone and iPad without any additional purchases. To do this, please first make sure that you are logged into the App Store with the same Apple ID used to originally purchase the app, so it will detect that you have already purchased it. Then, do the following. iOS 9/10: Go to the App Store, select the Updates tab, and then tap on Purchased at the top. Paprika 3 should show up in the Purchased section and allow you to install it from there. iOS 11: Go to the App Store, select the Updates tab, and then tap the user button in the top right corner. This will bring up your account information. From there, tap on Purchased. Paprika 3 should show up in the Purchased section and allow you to install it from there. We have noticed it sometimes takes a while for the App Store to recognize that you've purchased an app. You might also want to try restarting the App Store, or restarting your device, if you do not immediately see the app under the Purchased section. Can Paprika 3 sync with older versions of Paprika?